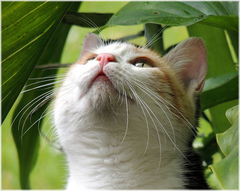 To understand cat behavior, all you have to do is think like a cat! You’re a predator at heart. Your instincts tell you to pounce, run, climb, perch and sometimes hide. You must keep your claws sharp. And you must protect your territory by marking its boundaries, because your life — and the lives of your offspring — depend on it. –— Of all our domestic animals, cats are the closest to their wild ancestors. In fact, some behaviorists think cats are not domesticated at all. — -Cats are independent, self-sufficient and resourceful, but they are not antisocial. When they live in our homes, they depend on us for attention and companionship. — Cats understand what we say to them. Some behaviorists believe that they have a “human” vocabulary of at least 200 words and probably more. — Cats think, comprehend and form bonds and attachments. They grieve for lost human and feline friends. — A cat values its territory more than anything else, including food and the opportunity to mate. — Cats are creatures of habit.Even the tiniest change in a cat’s routine or environment can cause stress and inappropriate behavior. — Cats do not “misbehave” out of spite. When they sharpen their claws on our furniture or mark their territory on our rugs, they are only doing what comes naturally. Understanding how your cats think will help you resolve cats behavior issues in a way that works for all of you. They’re wonderfully complex – and unique. Male Cat Behavior – Why Does Your Boy Do The Things He Does?